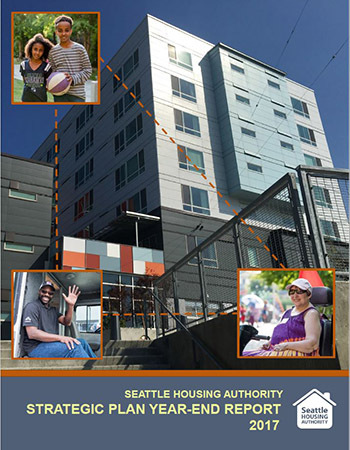 Seattle Housing Authority's five-year Strategic Plan is designed to guide SHA's efforts in enhancing the Seattle community by creating and sustaining decent, safe and affordable living environments for people with low incomes.​ The plan shapes everything SHA does as an organization, from staffing and budgeting to program evaluation and service delivery. The Strategic Plan consists of three parts: seven organizational cornerstones, which help form the foundation of how the agency advances its mission​; three strategic directions, or "big picture" outcomes that are the focus of work through 2020; and nine key objectives, which are measurable actions that guide policies and investment in pursuit of strategic directions. Every year, SHA issues a Strategic Plan report tracking key performance indicators and activities against the five-year Strategic Plan to measure progress toward our strategic directions and key objectives.